Branches Wilted; Holes In Stems Are Caused by Borers. Borers are wormlike, 1/2-inch long yellowish-white larvae of moths. They bore into stems underneath the bark, girdling the stems causing foliage on rhododendron branches to wilt and turn brown. Holes with telltale fine sawdust at their entrances are visible on affected stems that die. The partly grown larvae overwinter in the stem burrows and emerge as adult moths in June. Then, as small black, clear-winged moths, they lay eggs on rhododendron leaves, twigs or the rough bark of the main stems. Look for and crush any visible eggs in June. Cut out any infested twigs and branches below the borer holes and discard them in the trash. If major stems are affected spray bark surfaces with predatory nematodes anytime from late spring to early fall. These microscopic organisms are sold under brand named pesticide products as a powder to be mixed with warm water for spraying. Spray them on the moist bark surfaces in the evening and they will enter the borer tunnels, seek out the worms and destroy them. Chronic borer problems suggest that your shrub is under stress of some sort. Try to correct that problem. If the pH (acidity/alkalinity) of the soil is greater than 5.5, your rhododendrons may develop an iron deficiency because it is not acid enough. The higher the soil's pH is, the less iron is available to the plants. 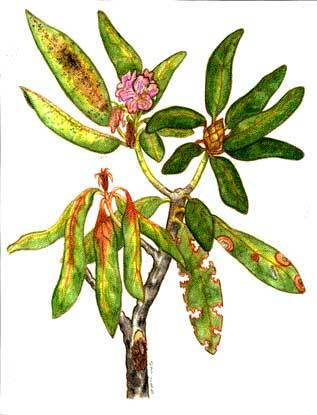 It is in the soil, but not in a form that rhododendron roots can absorb. This is a problem usually with younger, or newly planted rhododendrons. Iron chlorosis affects the lower leaves first, turning them yellow but leaving the veins green. The leaves may also be smaller than normal. If the soil tests higher than pH 6.0, sprinkle some garden sulfur on the soil at the base of the plant and water it in to correct the soil chemistry. For a quick fix spray foliage with iron sulfate or chelated iron. Mulching with peat moss and sprinkling used coffee grounds on the soil under the shrub will increase soil acidity over time. Large, well-established rhododendrons rarely get chlorosis because they are able to influence the soil chemistry and assure themselves a proper soil environment. If an established rhododendron loses vigor after several years and there are no obvious insect or disease problems, it may be suffering from a lack of calcium. After many years shrubs and trees deplete the naturally occurring calcium in the soil and it must be replaced. The best way to do this is to spread lime on the soil. Because lime is also used to reduce soil acidity, homeowners are understandably reluctant to use it around acid loving plants such as rhododendrons. However, an occasional application of lime will provide essential calcium to the soil without significantly jeopardizing its acidity for these plants. Flowers Collapse Because of Petal Blight. In humid conditions, this fungus peppers rhododendron blossoms with small white or brown spots. Overnight, flowers collapse into slimy mush. Once plant tissue is infected, it cannot be cured. However, a garden sulfur fungicide sprayed on healthy plant leaves and blossoms will prevent the spread of the fungus onto them. Pinch off affected blossoms immediately to retard the spread of the fungus to new buds. Because the fungal spores collect on the mulch beneath the shrubs and splash up on them when it rains, removing and discarding the old mulch in the trash and replacing it with fresh material may help prevent an outbreak from recurring. Foliage Burned From Dog Urine.